Parisian-born composer Jacques Ibert, a winner of the Prix de Rome at the Paris Conservatoire, was for a number of years director of the French Academy in Rome and the Paris Opéra Comique. Versatile and prolific, he wrote six operas, seven ballets and music for the theatre, cinema and radio. In addition there is a dramatic cantata, several orchestral and concertante works, vocal, chamber music and instrumental works, all equally beautifully crafted, with particularly idiomatic handling of wind instruments. Ibert is best known for a handful of orchestral and chamber works that have endured in the repertoire. The works most likely to be encountered are the Escales for orchestra (1922), Divertissement, for chamber orchestra (1928), the symphonic poem La Ballade de la geôle de Reading (1920) and the Flute concerto (1934). Music writer David Ewen has stated that Ibert�s scores, "usually combine classical forms with bright colours, a poster paint vivacity, sometimes unexpected harmonies and a piquant imagination ..." As a young man he wished to become an actor and it is certain that he had a fascination for drama in whatever medium. His certain dramatic gift found expression in colourful music, as evinced by the number of works he wrote for theatre, film, radio and opera. Seven years after the famous collaboration between director Orson Wells and composer Bernard Herrmann in the 1941 film Citizen Kane, Ibert was asked to compose the music to the film Macbeth. Shakespeare�s tragic tale of the rise and fall of ambitious 12th-century Scottish warrior Macbeth proved irresistible to Orson Welles and the movie was filmed in only twenty-three days. The Suite prepared from the film score is in six movements and includes such features as a breathing choir in the witches� scenes, set against eerie parts for piano, harp, celesta and percussion with string harmonics. The orchestration calls for piano, celesta, vibraphone, harp and a large percussion battery, including Millboard-bells, tabor and Chinese gongs. The first four movements all seem generally uninspiring but the work springs into action in the penultimate movement Death of Lady Macbeth which is a blend of poignancy and excitement with lots of brass, percussion and celesta. The quality of the music improves greatly as the work progresses and the final movement the Triumph of Macduff�s Armies is fast-moving with extensive use of the march and an exciting conclusion of blazing brass. Golgotha from 1935 was film director Julien Duvivier�s most controversial production. Golgotha was an ambitious and expensive retelling of the Last Days of Jesus Christ. Ibert composed the demanding and dramatic score in the busy year of his life, having composed music for four films, as well as his extended travelling and activities as �concert� composer and conductor. Ibert�s sound-world in Golgotha is varied and colourful, often adventurous and thrilling. I particularly enjoyed the movement Le Calvaire which is notable for the extensive use of the ondes martenot. The La Crucifixion movement is ethereal and passionate. The French/British production of Don Quichotte from 1933 is a faithful rendition of the Miguel de Cervantes novel, set in sixteenth century Spain, with a poignant ending added by director Georg Wilhelm Pabst. This highly successful film was a showcase for the vocal talents of Feodor Chaliapin the world famous Russian opera singer. The bass starred as Don Quichotte (Don Quixote), the Knight of the Woeful Countenance. The score is in essence a song-cycle for bass and an orchestra that varies from a five instrument ensemble in the first song to full orchestra in the other three. In addition, conductor Adriano has orchestrated a piano score of the song Chanson de Sancho. The song, the score for which was discovered whilst preparing this recording, was intended for the actor Dorville who was to play Sancho Panza in the film. Adriano is a passionate advocate of the music of Ibert. He works exceptionally diligently with the players of the Slovak Radio Symphony Orchestra to offer performances that show the music in the best possible light. 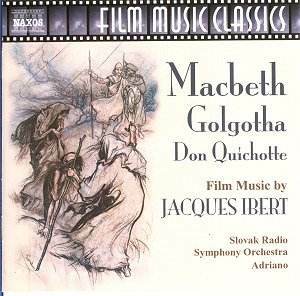 Recorded in 1989 and 1990 this release was previously available on the Marco Polo label and no doubt serious collectors of film music scores welcome the disc�s availability on Naxos at super-budget price. The sound quality is adequate and the annotation is pretty good too. Owing to the unexceptional nature of the music I doubt that this recording will feature very often, if at all, on my CD player. A disc that will appeal to Ibert devotees and serious collectors of film music.